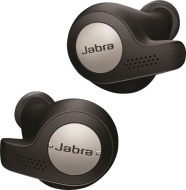 alaTest heeft 103 reviews verzameld en geanalyseerd voor Jabra Elite Active 65t. De gemiddelde beoordeling voor dit product is 4.3/5, vergeleken met een gemiddelde beoordeling van 4.0/5 voor andere Koptelefoons. Gebruikers waarderen het gebruiksgemak zeer. We hebben de consumenten- en expertbeoordelingen, de leeftijd van het product en andere factoren geanalyseerd. Vergeleken met andere Koptelefoons krijgt de Jabra Elite Active 65t een alaScore™ van 98/100 = Uitstekend. With the new Elita Active 65t, Jabra makes a great thing even better. In terms of both versatility and performance, these are the best fully wireless headphones you can buy. The wire-free Jabra Elite Active 65t earphones are built for exercise, with secure-fitting earpieces that deliver powerful bass that can be adjusted to your liking. Powerful bass and sculpted highs. Customizable EQ. Dust- and moisture-resistant design. Secure in-ear fit. Counts steps. Auto-pair process can be cumbersome, with only one earpiece pairing at times. Not for purists seeking accurate audio. Good passive isolation. ;Stable and breathable for sports. ;Better microphone performance with the proprietary dongle. Bulky in-ear design. ;Not as comfortable for everyone. Good range and wireless connection. ; Stable and breathable for sports ; Good passive isolation. Not as comfortable for everyone. The sporty version of Jabra's already wireless earphones have a few extras that put it over the top. The relatively tight, noise-isolating fit isn't for everyone. Motion sensor doesn't have much use at this point. The Jabra Active Elite 65t truly wireless earphones are the best alternative to Apple's AirPods, but the stepdown non-Elite model will save you a bit of cash. The Jabra Evolve 65t deliver excellent sound to be enjoyed in any situation whether at work or play. The Jabra Evolve 65t deliver excellent sound to be enjoyed in any situation whether at work or play.